The Brooklyn Public Library (BPL) system serves the 2.5 million residents of Brooklyn, offering thousands of public programs, millions of books, and access to more than 1,000 free Internet-accessible computers. The library wanted to ensure it was continuing to serve its patrons as effectively and efficiently as possible. CIO Selvon Smith wanted to gain fast, easily-understood access to his data, but the library’s reliance on consultants and an outdated reporting system stood in the way. After discovering Tableau, Smith’s team realized they could do far more than replace existing reports—they could speed decisions, improve insight, and tell their stories to management and to their public in a visual, exciting way. Tableau helps us tell the story of what the library does in a way we've never been able to before. Telling a story rooted in data—rather than anecdotes—is a much more powerful way of getting across the depth and breadth of what we do here. Brooklyn Public Library is an independent system, separate from the New York and Queens libraries. “We do so much to touch the lives of people in Brooklyn,” says Selvon Smith, CIO, Brooklyn Public Library. Smith and his team are driven to constantly improve the library’s ability to meet its patrons’ needs. But in order to do so, they needed better access to—not to mention analysis of—the metrics around various patron touch points. For example, the library used a PC and print management software application from Pharos Systems to manage many functions such as PC reservations and patron fine processing. Because the library was not a typical use case for the Pharos software, none the application’s preconfigured reports met BPL’s needs. Instead, BPL required the help of consultants to take on the work of extracting and manipulating the data. “We had four consultants looking after the whole Pharos PC and Print Management system, and also producing reports in Crystal Reports,” remembers Nissa Wibecan, a Systems Administrator at Brooklyn Public Library. Analyzing the data in these Crystal Reports was exceedingly difficult, Wibecan recalls. She regularly spent a full two weeks each month working to produce regular patron resource and kiosk activity reports, for example. Because accessing data was so time-consuming and painful, Smith’s team had to be very strategic about what questions they tried to answer using data. For example, BPL charges small fines for late, lost, or damaged material. Balancing patron accounts across the hundreds of thousands of library card holders to accrue or pay a fine each month was extremely challenging. As a result of these challenges, the BPL was not as data-driven as Smith’s team would have liked. “In the past, the answer you might get could depend on who was generated the report and the parameters they used. So you might ask one person and get one answer—but if you asked someone else, they’d give you another number,” he says. Smith quickly realized that his team could use Tableau to do far more than simply replace Crystal Reports using Pharos data. “We started to understand what the product can bring—we understood that we could do something with it outside of the Pharos environment, which is where we got buy-in from senior management,” says Smith. Today, the library connects to a Microsoft SQL Server data warehouse using Tableau. The warehouse stores data from a variety of different data sources. The team also uses Tableau to blend data from SQL Server and Excel. Part of the new direction for Smith’s team came with the creation of a new Strategic Planning Office, which included implementation lead and Project Manager for Strategic Initiatives, Diana Plunkett, ending an annual contract for organization performance management analysis, ending a service provider contract to analyze financial transactions, and training one staff member to transition from administrative duties to an analyst role. Today, the library has fifteen employees using Tableau Desktop to author dashboards. The library has invested in Tableau Server for publishing and sharing the interactive visualizations. Some employees of the library are taking advantage of subscriptions in Tableau Server to receive updated dashboards directly to their email inboxes. 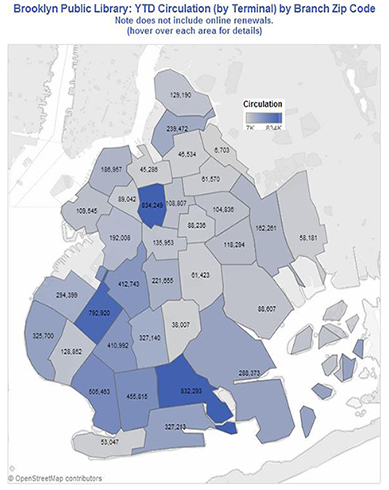 The library is also using Tableau Public for some of its public-facing data visualizations. The team is looking at a wide variety of data sources to help identify opportunities to improve the library’s service to its patrons. For example, Plunkett has put together a usage rate visualization to analyze the demographic information and library usage patterns of a selection of its most prolific patrons. “It was visually compelling. And we could look on one page and learn quite a lot about who the patrons are, which branches they were using, what age they were, and that helped us make some decisions,” says Plunkett. Library management is using this information to support business decisions and assist with development planning. In another example, Smith has begun tracking PC sessions per month and he has noticed that WiFi user sessions increase each month—in fact, the WiFi sessions are outpacing PC station usage. “I think that what helped with the broader adoption in our organization—which is ongoing—was a sense of ‘build it and they'll come,’" says Smith. Plunkett says that that “one of the most satisfying things” is when another library employee will approach her with a Tableau success story. “Someone came up to me recently and said they learned about how world languages were circulating in their branch, and as a result they have changed their book displays,” she recalls. Enabling more data-driven decisions. “We're changing the culture,” notes Smith. The team is pleased that everyone from management to individual branch librarians are increasingly looking to data for decision support. Saving two weeks each month. The regular kiosk reports that used to take Wibecan two full weeks are now completed in an hour. And what is she doing with all of that time saved? “I’ll have to look into that!” says Smith with a laugh, before commenting that the new, more data-driven culture means that Wibecan—and the rest of the team—are busier than ever fulfilling new requests. “I can safely say we reclaimed the value of the ten days Nissa spent working on the old reports,” Smith says. The team also appreciates how quickly Tableau allows them to answer ad hoc reporting requests and how much time is saved by the fact that management can use Tableau to answer many questions on their own. Wibecan and Plunkett say there is one more benefit they, personally, are experiencing thanks to the library’s adoption of Tableau: More enjoyment in their daily work.